‘I intend to try and work harmoniously with all of my evolving selves’. I wrote these words in August 2018, my last blogpost. At that time, I had little idea, to be honest, of what this well meant intention would entail and how this in turn, would impact on my health and sense of wellbeing, hence the long gap of silence between then and now. In the interim I’ve devised a kind of self-help/ therapy on my bumpy road to recovery; shoreline walking along with writing and making in order to figure out what I’m thinking. This has become my daily ritual. Sitting the studio just now, I’ve realised that my efforts to engage with the small textile I’ve been working on recently (Figures 1, 2, 4 & 6), embody how I am experiencing this stage in my life. 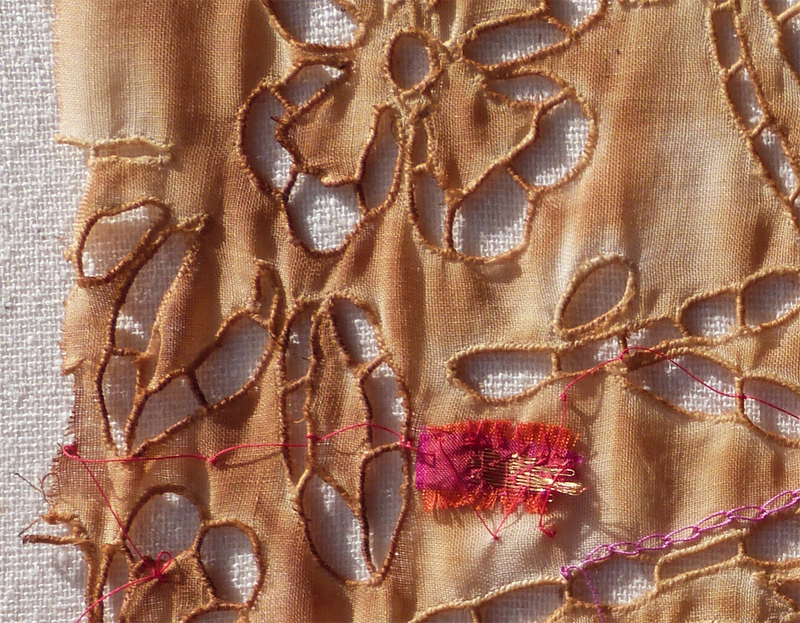 The work itself looks innocent enough; I’m working on top of a piece of beautiful cotton; old, hand-stitched and now dyed and ‘faded’ by me to emphasise the aged appearance I feel it holds within its fine weave. 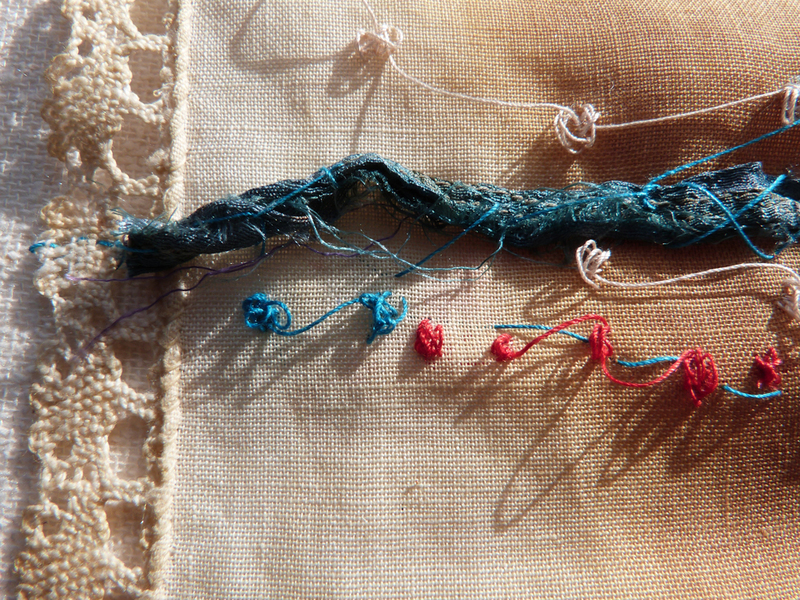 (I enjoy working on and with old hand-sewn textiles and used a larger piece of this old cloth to convey how I imagined the thesis might look). 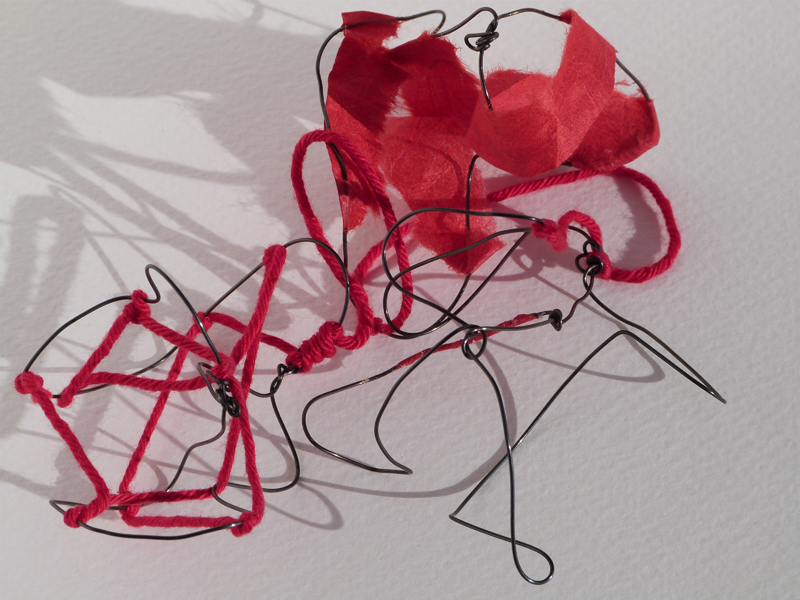 I’ve frayed some of the edges and am overlaying it with hand-stitching and tiny strips of well-worn sari cloth – all of these gestures appear hasty and irregular, as was my intention, for in doing this I’m constructing meaning. 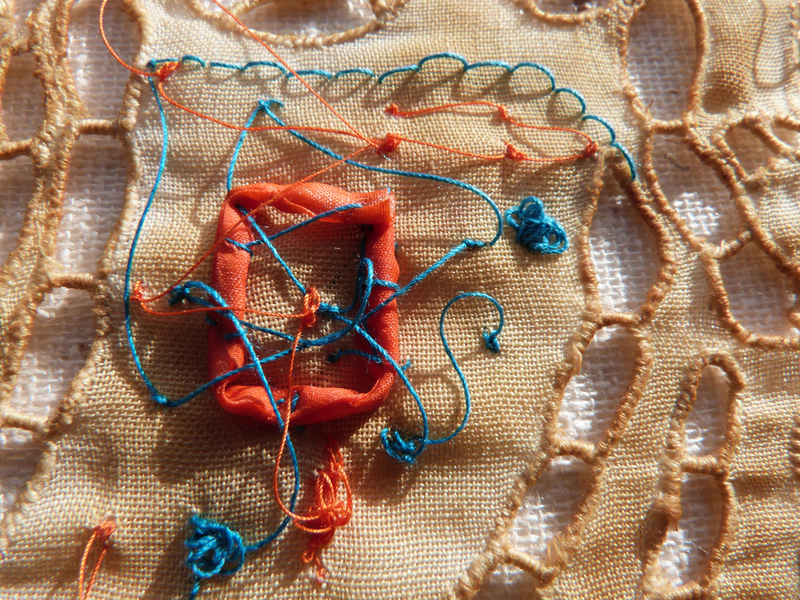 But I’m also aware of an increasing inner tension between my urgent need to create marks on the cloth, primarily as a tangible confirmation of identity and my longing to slow down the pace of frenetic hand-stitching and instead, rhythmically stitch my way into the restful, open space between mind, body and material. I’ve been aware of this this tension before, yet I see now that it too is transitioning and is far less concerned with my imposing my will on the cloth and more about trying to exorcise my inner anxiety and frustration. 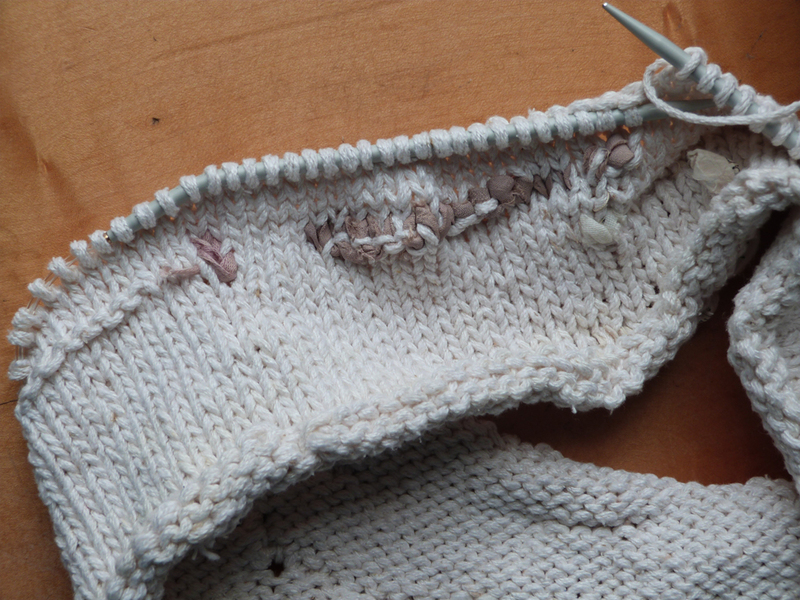 And so every now and again, I find myself wanting to make tiny stitches as a statement of skill, in a bid to counterbalance the delicately hand-stitched base cloth and my overlaid awkward efforts, as if to say; ‘this isn’t really me, I can really do so much better than this’. Self-dialoguing is integral to this push/pull process (Figure 2). All this feels as if I’m reaching across time; this old cloth, imbued with traces of memory and existence, skilfully hand-stitched decades ago, now finds itself with my ‘voice’ (tentatively) scratching at its surface as I express my own story. Does this realisation make me feel ‘better’? To some extent in that it offers an understanding, a clearer insight into how I ‘am’ just now. I’m working in quick, erratic bursts of activity which offer a temporary respite from the inner strain of constant questioning of why I’m doing this and what ought I to be doing or what would I like to do. But while offering insight, it suggests no real sense of direction. But maybe the path is there and I just don’t see it? Submitting to the interaction between mind, body and material seems to weaken my need to control, which begs the question; is this an exploration or an expression or maybe both? The tiny 3D mixed media forms I’ve been making these past few months (Figures 3 & 4) feel as if they’re conveying the same meaning as my current hand-stitching, as does my ongoing, sporadic hand-knitting full of intentional mistakes, further emphasised by using round needles, expressing that inner conflict of going round and round with no end in sight (Figure 5). Yet each separate process suggests a journey towards ….. I’ve no idea where. But maybe, intuitively I don’t want a destination, I want to remain a wanderer, committing to nothing, open to possibility? This makes some sense to me as I understand creative process to be a journey from the unknown to the known. All these tentative steps are important and communicate as much meaning (to me) as my research collage as a form of methodology ever did throughout the PhD. 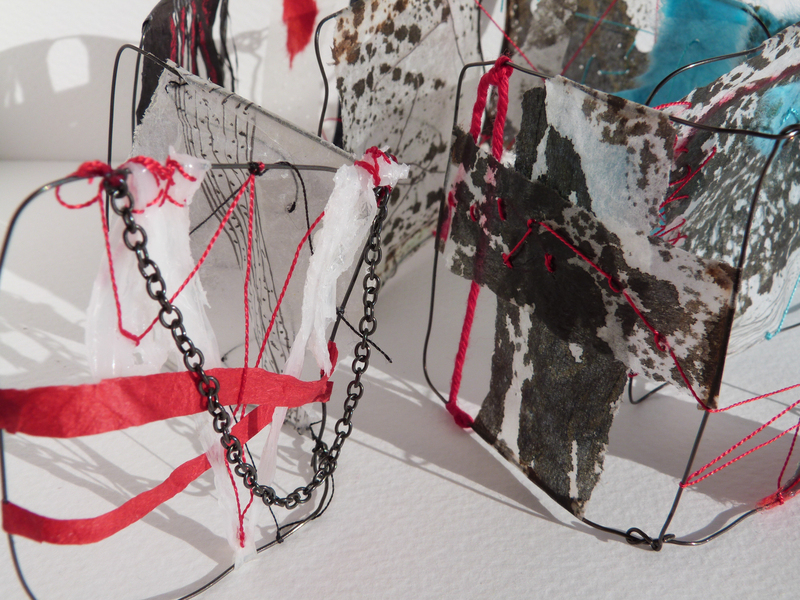 The key difference now is that I’m focussing exclusively on working with my hands and fingers to think through, to elicit and finally to communicate meaning, initially with wire and paper and now with stitch on top of old cotton. What they all express is a form of contradiction; an unconscious, unfolding awareness of self. Now that I think that I can see what I’ve been doing these past months, through working intuitively and without a plan – will I continue? Is there any point now that it will be a conscious act? As an answer, perhaps I need to look backwards over the path I’ve travelled these past 8 years. All the PhD artwork I created was itself a form of searching for understanding, what I’m doing now is still part of that continuum. But I’m aware that I have a quiet dread of committing to a large piece of work, I’m more comfortable making small steps than grand gestures. These whispers of being and becoming are enough in themselves for now and are a part of my daily ritual. In my thesis, I wrote that ‘I can’t unknow what I now know’. How true. I’m not the same as I was pre-PhD, I don’t work in the same way and can’t go back and just pick up the threads of spontaneous creative process. But I made the mistake of thinking that I could and struggling to find the way back has been challenging. Finally (hopefully) accepting the shift in my creative practice, seeing it as a positive rather than something to be overcome, has to be my way forward. This thought feels familiar – I’ve said this before. But now, significantly, I recognise that going round in circles is an integral part of my way of working and this itself brings rewards as well as perhaps necessary frustration. I also acknowledge what underpins all of this angst I’m grappling with now – ageing, gender and the prevailing cultural discourse around these inextricably linked issues and their impact on my daily life. This has been my ‘elephant in the room’ moment today. And so looking beyond my tiny world here in the studio, I sense where all of this endeavour could well find itself being located. In responding to the call by Germaine Greer (2017) for women to offer a narrative of their own strategy of coping with old age, this could also answer my need of a sense of identity and meaning. What I’ve been doing, intuitively, as a way of surviving post PhD these past difficult months, is a form of life writing , but one that uses visual methods and journaling. And yet this life writing is also emerging from the years I spent as a PhD student. It all feels quite incongruous in that what I was desperately trying to move away from, actually held the key to where I need to go now. Once again, running round in circles, blinkered and stubborn. But, ‘we are all solipsistic, and actually the exercise itself demands as well a measure of detachment’ (Lively, 2013, p. 27). It’s this sense of objectivity which is crucial otherwise running round in circles will be self-defeating. Sharing the stories of our lived experience of ageing is as important for those who follow, as it is for us travelling through it. Greer, G. (2017). Afterword. In Ageing Women in Literature and Visual Culture: Reflections, Refractions, Reimaginings. McGlynn, C., O’Neill, M. and Schrage-Früh, M. pp. 321– 325. Cham: Palgrave Macmillan. Lively, P. (2013). Ammonites and Leaping Fish: A Life in Time. London: Penguin, Fig Tree.